Cornwall has long been my bolt hole from the world, where I come to switch off. I find myself back here for the second time in a week, spending this glorious Easter weekend with family. One of my favourite pastimes here is walking the coast. There is a particular stretch I must have walked a hundred times over the years, between Portreath and Godrevy. Since my family moved to Illogan, I have turned it into a round walk, from the top of Park Bottom, through Tehidy Woods to the coast, past Hell’s Mouth and on to Godrevy Point, then back to Portreath. I’ve yet to to do the full round walk on this trip, and might not, but I have made the trip to Godrevy and Hell’s Mouth a couple of times. Here are some photos from my walks over the last couple of weeks, including the seals basking on the beach. I’ve also thrown in a few of Holywell Bay that I only discovered, shamefully, last week. Cornwall has also inspired a lot of writing, too. This is a piece from a few years ago that was inspired by a walk very similar to those I have enjoyed these past weeks. Lives an ocean’s sail away. More often alone than not. Of those of us that knew. Of coast above all others? Close my eyes to dream a while. 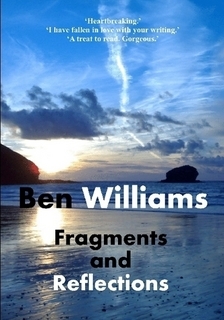 In the years since publishing Fragments and Reflections, I have self-published two further collections of poetry: Nooks and Dark Corners and Sunsets and Long Shadows. Find them on Amazon or – if you want to support independent writing and publishing – Lulu. Just apparent in this strange eradication. Taunting it with windborne lies of endless sunshine.